Rafa lives in the apartment from which we are going to watch the Running of the Bulls today. He works in the International Red Cross but these days he has stayed in Pamplona and at 7.00 a.m. he goes out to the street to work with the emergency service. From his ample sitting-room there are four large balconies which look down on Mercaderes Square. An antique typewriter catches my eye and I ask him if it is some kind of literary relic: “It belonged to maestro Turrillas” he responds. Turrillas was one of the best known music composers for brass bands in Navarra in the last century and some of his musical pieces can be heard every day during Sanfermines at all hours of the day or night. Many visitors want to pack in all the best of the Sanfermin fiestas in one, two or three days. And in this “menu” the main dish is getting to watch the Running of the Bulls from a good balcony. First, they are informed about the background and the essential facts of The Running of the Bulls. There are guides who can speak in English, French, Spanish and Basque. Some people come well-informed beforehand, especially the Americans. There are others who don’t even know how many bulls take part … or where they will run from! Nearly one thousand people have booked balconies – among them 200 Spanish visitors – the rest are made up of 34 different nationalities of the most varied kind: Russians, Chinese, Japanese, Americans (from North, Central and South) Australians, Portuguese, French, Italian, Swedes, Germans… and Spanish from all parts of the State. “Sólo se vive una vez”. (‘You only live once’)That is the title of the Bollywood movie that has been the biggest box-office hit of the Indian movie industry, and it was this same movie that has motivated the Indian couple, Nikita and Chandra, to come and visit the fiestas of Sanfermin. In the movie they saw the scenes which had been filmed in Pamplona during fiestas, as well as other Spanish events and locations such as Tomatina de Buñol, Andalucía… and so they decided to follow the same tracks as the protagonists in the movie. They have rented this balcony to watch the Running of the Bulls. But they will not go to the afternoon bull fight because they would suffer too much watching the Bulls die in the arena. “Does it show that we are Indian? “ They ask me in that distinctive funny accent that Indians have when they speak English. I reply by making the typical Indian gesture, inclining my head both left and right, which is an “affirmative “answer for them and which for us, might be more a “perhaps” . The balconies are transformed into a veritable assembly of the United Nations in which most of them appear in similar dress and most of them are looking for the same goal: to live the fiesta to the full. The moment when the balconies are opened to allow the people to step out is an exciting one. Below in the street, the runners are gathered in groups, saluting and greeting one another and encouraging each other with best wishes before the start of the event. A warm bright light of sunshine adorns the early-morning image of a stretch of the course. The sense of excitement is thick in the air. The municipal police begin to clear the streets of any “unwanted” runners that have an excess dose of alcohol and the Red Cross First-Aid Teams take up their positions. Pedro has been dreaming of this day for the past twenty years. Born in Lisbon, where he lives, ever since he was a child, he has been hearing about Bulls, Bull-ranches, Running of the Bulls and capeas with the bulls… he soon learned that in Pamplona the most singular Running of the Bulls in the whole world was held every year during fiesta week. He knows exactly what is going on here in fiestas because he is a great fan of the whole thing. Thanks to Internet he can now devour all the information that he can find. He even knows the names of some of the workers who put up the fencing such as Pascual, or even some of the bull minders like Mikel Reta. 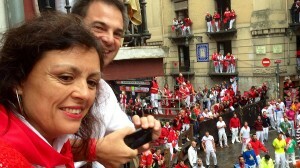 The sanfermin.com, page, as well as the special TV reports Sanfermines de TVE, are the favorite media outlets for Pedro. He has read and seen it all. This year, he discovered that, in addition to information, he could book a visit that included a balcony view of the Running of the Bulls. Afterwards, there is a breakfast in the Nuevo Casino Principal, and then he can also go to the afternoon bullfights and even watch the Fireworks display at night having some dinner with other people. If he wishes he can have a guided visit to the Sanfermin fiestas or choose a hotel…He did it all by Internet and surprised his wife, Marina, with a four-day surprise trip to the capital of the fiestas. His happy eyes say it all: he is really pleased to be in Pamplona. He asks sensible questions, he appreciates the personalized treatment he is receiving and, judging by what he relates, it would not be a bad idea to ask this civil engineer who is so enraptured by our Running of the Bulls to write a book about all he knows on the subject. Sanfermines is for all ages and for all tastes. 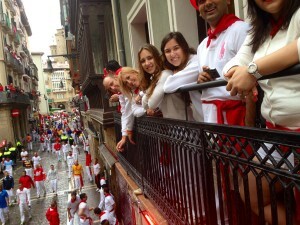 To the surprise of this family from Toledo, Sanfermin is much more than just partying, drinking, and bulls. This family of four has come together and they spend a great time together all day. 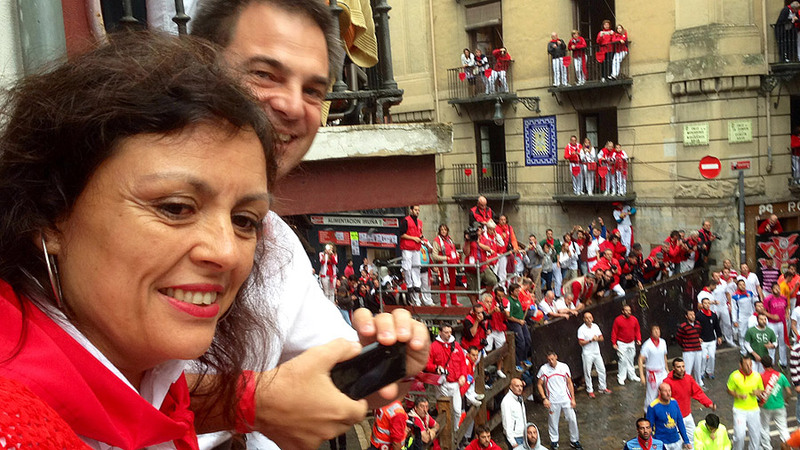 Yesterday, they watched the bullrunning from the bullring and today they have decided to do it from a balcony. Afterwards, they will go to have some traditional fritters and hot chocolate in Mañueta street. They will look for the Giants and all their entourage , they will dance with the brass bands in the streets… The two daughters, aged 14 and 17, are already planning to visit in the future with their mates when they are a bit older. They have not slept much, normal enough during these days, but it was worth getting up early for this event. From Calamocha, Teruel, five workers have come from the Prefabricados Francisco Hernández firm. This Company did the shuttering work for the ‘hotel’ in the pens where the Bulls are kept during Sanfermines, at the Corralillos del Gas. One of the workers relates the anecdote that when the bull-minders and the Mayorales (charge-hands)saw the height of the wall, they were stunned: the bulls could see them whenever they passed by and that was always a dangerous thing. There was an easy solution found by adding a metal finish to the woodwork. The exteriors of the pens have also been painted in red and white as recommended by these same shuttering workers. For these reasons, these workers feel that the bullpen “hotel” is partly theirs and this year the firm has presented them with a free weekend in Sanfermin fiestas so as to disengage the neurons or to provide some inspiration, depending on how you look at it. Where is Robert, the New York kick-boxer boxer? The mandatory three rockets go off and then everything happens very quickly: The packs of animals and runners cross the square at a very fast pace, some slip up, some are knocked over by the bell-oxen. We suddenly manage to see Robert running like a hare… until he trips up… but up he gets again in two seconds flat. A small fright…his shirt is dirty…a gash on his knee…he seems to be limping…and that’s about it…but something very important; he has a big smile of satisfaction on his face! We hail him from the balcony and he comes up to watch the repeat action on TV in an incredible run where he was close to the fighting bulls. And indeed, there is Robert on the screen, amid dozens and dozens of other runners.